It is snowing here... it is SNOWING here. Whatever happened to March coming in like a lion and going out like a lamb? This lion is ROARING! The only reason why I am whining about the weather is because I am tired of winter. This past winter seemed particularly long and there was lots of snow. I suppose it is a typical Edmonton winter... but I moved here a few years ago and I thought global warming had taken root firmly here and so we didn't see the typical Edmonton winters of 3 feet high piles of snow and extended periods of -30oC weather. I remember the previous winter in November when the weather was 8-12oC, right into December. Its the kind of winter I can tolerate. The neighbour's bunnies are seeking shelter under the picnic table. It must be fairly windy outside as the snow keeps blowing in all directions. I am gazing at those bunnies in hatred and malevolence. No, I am not a bunny hater- just that those bunnies killed my pumpkins last year. I am not a gardener and last year, my daddy gave me some pumpkin seeds to grow in my humungous garden (another long story). I grew these pumpkins from seed- I nutured them and babied them- there were four plants. All summer, I was out weeding around them, checking up on them every evening, watering them, worrying about them when there were reports of late afternoon hail. When I discovered I finally had pumpkins, I was pleased as punch. There were two fruits.They kept getting bigger over the summer. The first sign of something not right was when I discovered some gnaw marks on the larger pumpkin. Someone had also taken bites of some windfall apples as well. I thought it was the neighbour kid- he is approaching teenage years and is often outside in the yard. I was *not* impressed but, well, as long as I hadn't caught him in the yard, I could not do anything. So, it was an early fall morning. I had a few minutes before I'd be late for work- so I headed out to the patch out back. To my absolute horror, it was a pumpkin massacre. Bits of pumpkin were EVERYWHERE. 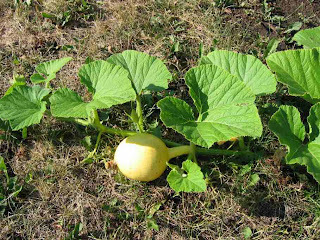 Both fruits (about the size of a giant cantaloupe) were strewn all over the garden. I started to cry because I was so upset. The fruits of my labour were destroyed. And I didn't know what had caused this destruction. It seemed particularly cruel to imagine he neighbour kid doing this- and it didn't *seem* right. I could not bring myself to speak to the neighbours as I was so mad. When I finally did, it seems the bunnies had dug their way under the fence and escaped into my garden. And killed my pumpkins. AARRGGGHHHH!! I kept hoping that they would not withstand the winter. But, no, Splotch and Death are happily hopping around the neighbour's yard- frolicking with the dogs and the cat. Posted by Diane aka cameldiva at 9:38 a.m.